If sending a note card or postcard and don't know what to write, please tell me about your favorite breakfast (what you eat, where, with who, why you love it...). rocks, stones or gems... any type of rock is welcome (rough or tumbled). I would love anything made of stone (bracelets, figurines, heart shaped...). If you find a rock shaped like a heart, I'd be thrilled to receive it. A rock you've painted or decorated would interest me. Anything to do with books or reading. Any Christian item... Philippians 4:13 is my favorite verse. I would enjoy receiving anything with that verse on it. Used postage stamps! I am always looking for stamps for a project I am working on. I would love any postage stamp, but I am especially looking for old, foreign and Christmas stamps. If you sew, I would really like cloth napkins made from material with neat patterns. No need to make several, one is enough. For example, little frogs, Christian themed, Halloween, anything with a vintage pattern, especially mushrooms... And I would be thrilled with a cloth napkin that has fox on it! I am not looking for your average kitchen design for the napkins. I am looking for something for me to enjoy. little wrapped gifts for my Christmas stocking and for my rainy day basket. Also, feel free at any time to send one for my Halloween treat bag too. Just let me know which place to put it. Hello. I am a 44 year old mom. I have twins - a boy and a girl. My daughter has moved out, but my son is still at home with me. I live in the mountains & love it here. I have a little home on my land. I have started a small orchard with apple, peach, cherry, & pear trees. I also have blueberries, raspberries & grapes. I enjoy gardening. I would like to have my own little farm. But not one with lots of animals. Mainly because I don't have enough room for that. I have cats, chickens and a dog who is completely spoiled. I've always been a cat person, but this puppy stole my heart. He is a great pyrenees mix. He is so cute. Dog toys & treats for my pup are always welcome! He's a big boy now, so toys have to be tough. A little more about me... I am a Christian. I love the Lord! :) I enjoy camping and hiking. I like to look at the sky and especially the clouds. I also enjoy genealogy. One of my favorite places to visit are cemeteries. They are so peaceful. When my twins were very small, we would visit a cemetery and take a picnic. When someone would ask the twins what we did that day, they would say, "We went to the graveyard and had a picnic!" Some found this to be morbid. The twins just thought it was normal. I love to read! I love reading my Bible. My favorite book is To Kill A Mockingbird. I read books by Stephen King. The Stand & Cell are my favorites that he has written. I also like Frank Peretti & Ted Dekker, Jeanette Oak & Edgar Allan Poe. I really enjoyed the Left Behind series by Tim LaHaye & Jerry B. Jenkins. One Second After is another of my favorite books & I like almost any 'end of the world as we know it' book. Joyce Meyer, Billy Graham & Max Lucado are also authors I enjoy reading. I do love to read. Sitting on my back porch with a good book is one of my favorite ways to spend a lazy day. BOOKMARKS!! I love bookmarks! And I am always in need of new ones. I mark pages in almost every book I read - recipes in my cookbooks, a quote I want to go back and read, the thing in one of the self help books I need to remember... You get the point. I love books & bookmarks! I have also started collecting them. They are as awesome to collect as postcards! So many! I love them all! I would like any kind - history, animal, scenery from your country, cities or houses, quotes, pretty, cross, Bible verses, Christian, anything from my likes, cloth... If you could find me one of 'Three Little Pigs', I would be thrilled and love you forever! I enjoy learning about where the postcards come from and the person who is sending them. I like my postcards naked. What is written on the back is as important to me as the picture on the front. I have started doing more paper crafts. I am learning and really enjoying doing them. I would love to receive anything I could use with paper crafts. I have not made any ATC's, but have received some very cool ones. I may give it a try someday. Please do not send any scented item. I have asthma. I do not wish to receive any candles, body or bath products... Nothing scented or smelling of smoke, Please. Also, I am allergic to the majority of bath products and lotions. I break out in an itchy rash. You may send me bath products if the product is all natural. No chemicals or fragrance. I would happily like anything completely natural with essential oils. I do not wish to receive any food items unless I join a food related swap. I enjoy healthy organic food. I love to grow vegetables, fruits & herbs and I do love to cook. I enjoy trying new recipes. I love dark chocolate. It's my favorite. I do NOT like banana flavored candy, white chocolate, or candy with peanuts. TEA - I love tea. I enjoy herbal teas, fruity and green teas. I do not like black tea. Please do not send loose tea. I would like to receive prepackaged only. I use cloth napkins so I love getting those! And they don't have to match. Hand made ones are awesome!!!! RECIPES ~ If you are sending recipes to me, I prefer Healthy recipes. And I do prefer vegetarian ones, but I do occasionally eat meat. I enjoy doing Christmas stocking stuffer type swaps & receiving little wrapped gifts. I would love any Christian themed Christmas ornament. I love the color orange. Any shade of orange just makes me feel happy. Yellow is also a color I love. Autumn is my favorite time of year. I love all the orange leaves and pumpkins. I also love the weather at that time. I would love to recieve anything Scarecrow! I like butterflies, mushrooms. I just love pictures of mushrooms, books & bookmarks (I can never have enough bookmarks), note cards, stickers & such. I like book pages to use for crafts, especially ones from different countries. Halloween is my favorite holidays. I enjoy decorating & watching scary movies & just the playfulness of it all. I also love Christmas. My favorite animal is a fox. My favorite flower is Lilac & Dandelion. I would really love anything with a dandelion on it! I can always use blank recipe cards! I really enjoy receiving them! I also would like used postage stamps, especially ones from other countries. I like vintage items, Tote bags from other areas, Pressed Pennies & Souvenir Coins. Amazon gift cards for any amount are always welcome. Comment: Thank you for the Christmas card, bookmark and tract. You shared great ways that you keep Jesus center in your Christmas. Comment: Thanks for everything you sent. I have seen some of the books you mentioned on the Amazon kindle site - the type I like to read. The tea flavor is a favorite! Merry Christmas! Comment: Thank you dear, can't wait to try your favorite tea! Merry Christmas! Comment: Great Letter "M" words! The sparkle post card is neat! Thank you a bunch! Comment: I loved the joke you sent in this swap! Great laugh! I will be sharing that one. Thank you for the card and other things Merry Christmas! Comment: Thank you for the lovely card! I love your Christmas tracts!! Comment: Got it! thank you! Opening in December EDIT: All the recipe cards. Thank you so very much!!! Comment: thank you so much! I can't wait to open them. They're so pretty. Comment: Such a cute card! Thanks so much and I can't wait to try the tea. Merry Christmas! Comment: The card is in the house and is assigned to Dec 17th. Woo hoo! Thank you! Comment: Pretty card. Love the recipe cards. Comment: Thanks so much!!! It’s almost time to open all my cards!!! ...for my pink gifts that you sent me for Christmas and all my advent gifts too! I have been enjoying all the wonderful items you sent! The bookmark that say's Don't Forget is a great idea! So many times I have read a book and wanted to remember things I read, but was too lazy to go write it down. Haha Where did you find it? Anyways... Thanks again and I hope you're doing well! I just created a tea swap if you'd like to check it out. :) I hope you're having a great day! Thank you for the 21 Day Devotional on Easter. I will read it. It looks like very interesting reading. I just unwrapped the books we swapped earlier. Both look very interesting. Thanks and merry Christmas! Knock, knock! 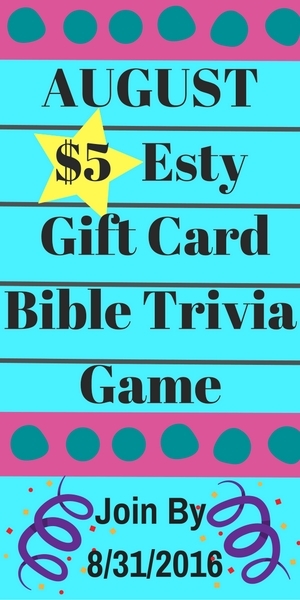 I'm just stopping by to invite you to take a look at our Christian Swappers Group forums, we have an AUG: $5 Esty Gift Card ðŸ™ Bible Trivia Game going on in the group forum now.